Product prices and availability are accurate as of 2019-04-21 13:12:05 UTC and are subject to change. Any price and availability information displayed on http://www.amazon.com/ at the time of purchase will apply to the purchase of this product. The Schlage M492P maximum-security electromagnetic lock meets or exceeds Builders Hardware Manufacturer Association (BHMA) 1,500-lb. hold force requirements per electromagnet, can connect to an access control system, and connects to a door access system such as a push bar, request-to-exit device, or credential reader to create a secure locking system for a double inswing or outswing door. The electromagnets mount below the top of the doorframe using the included bayonet mounting bracket that enables hands-free installation of the magnets. The armatures attach flush against the door and pivot to compensate for slight irregularities. The magnet portions are active when connected to a power source, and they lose their magnetic hold and unlock the doors when power is removed either with a door access system such as a push-to-exit button or by power outage (also called a fail-safe design). The automatic voltage selection feature distinguishes between either a 12- or 24-VDC electrical connection and adjusts the lock automatically, eliminating the need for field adjustment when voltage changes, and the automatic surge suppressor protects the equipment from damage if voltage spikes. The lock housing has a satin chrome finish. When used with an access control system, the lock's door-status and magnetic-bond sensors communicate with the system to identify if a door is open or closed and to monitor the strength of the magnetic connection to ensure a strong door hold. The lock can be programmed with a 0.5- to 30-second relock delay. Specifications met Lock meets ANSI/BHMA 156.23, UL1034, and UL10C specifications. Lock meets or exceeds BHMA 1,500-lb. hold force requirements. For more information, see the manufacturer's literature. Electronic door locking systems use electric current to control and secure access. Entry is regulated with a door access device such as a keypad or a reader that limits entry to authorized users. Some systems can designate user access for specific hours or days and may include a keyway for mechanical override. Common electronic locking mechanisms include electromagnetic locks and electric strikes. These systems are hardwired or battery powered, which is suitable when electrical wiring is not readily available. 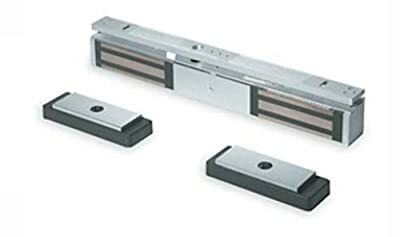 Locks are available in cylindrical and mortise styles. A cylindrical lock requires two bored perpendicular holes in the door for installation: one in the door face and a crossbore hole in the door edge. A mortise lock fits into a pocket recess in the door edge. 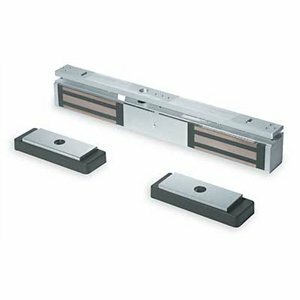 Schlage Electronics, an Allegion brand, manufactures security products for commercial and residential use. Allegion is headquartered in Carmel, IN.